Pishing is the use of sound - often a shushing or whispering sound - to attract the attention of birds, especially skulkers. 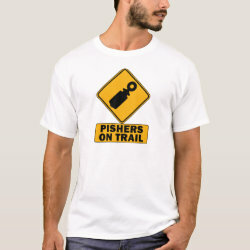 Warn others that More... they're birding with a pisher with this original spoof design. An orange traffic sign shows a large wooden bird call in silhouette with clear text PISHERS ON TRAIL below.